Wish I’d had to travel to Alaska to meet Jennifer Lynch (I’ve been wanting to experience Alaska for years!) but our paths crossed in the southeastern part of the United States where we both now teach. Jennifer is a Media Center Specialist in an elementary school that also serves a Pre-K population. 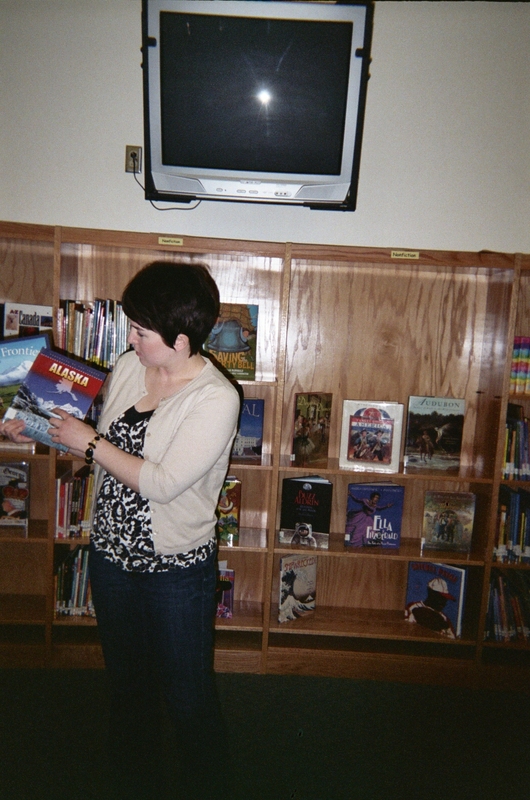 Ms. Lynch shows books about Alaska. Jennifer was born and raised around Anchorage. She attended Fire Lake Elementary School (I love that name!) from Kindergarten, when Jennifer first knew that she wanted to be a teacher, to Grade 6. 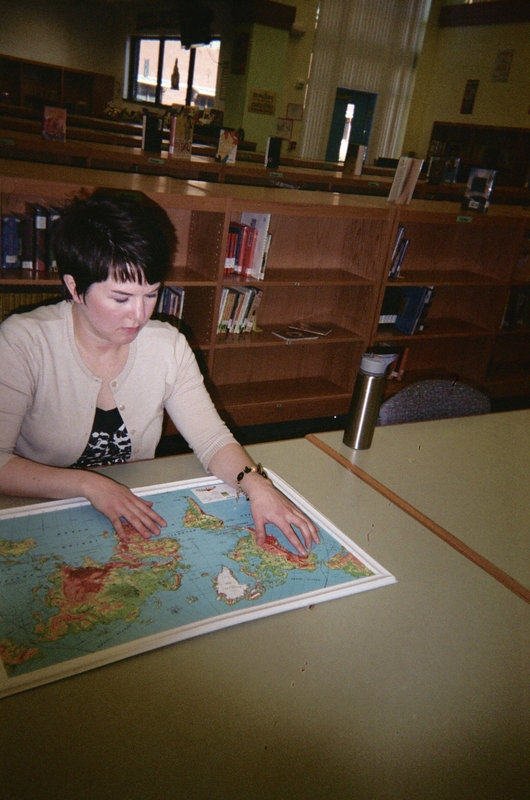 Alaska, she says, is just now converting to the middle school structure of grades 6 – 8 that is used in most states. When I asked Jennifer to recall tools and tricks that any of her K – 5 teachers used effectively to catch and keep her attention she first mentioned the rhythmic clapping of Mrs. Kincaid in Kindergarten. A smile spreading across her face, Jennifer quickly added that her mother was amazed at how well Mrs. Kincaid commanded attention with such a simple strategy! As a parent, Jennifer’s mother obviously felt good about leaving her daughter in Mrs. Kincaid’s hands. NOTE to teachers…maybe an obvious one, but we all get so busy that we can sometimes forget this…it’s good to put yourself in the shoes of parents and your students as you make your classroom plans. Ms. Lynch demonstrates learning by doing. so that we could learn by touching and discussing. It was literally hands on.” Jennifer demonstrates this teaching technique in my blog pic here. Mapping out strategies to help children prepare for the global marketplace – maps – raised relief and other kinds – are some of the coolest tools. I recently read about Gilbert H. Grosvenor, the founding editor of National Geographic magazine. He’s credited with saying, “A map is the greatest of all epic poems. Its lines and colors show the realization of great dreams.” Maps today come in so many different versions – print, 3-d, online and interactive – great opportunities for your students to explore the world. Hummm…an Alaska native living and teaching in the southeastern US. Do you suppose that one of Jennifer’s best tricks has been her relocation to warmer climes?